Learning New Reactions: How Do The Electrons Move? Last time we talked about how electrons are the “currency” of chemistry and every reaction is a transaction of electrons between atoms. That means that if we really want to understand a reaction, we have to understand where the electrons are (and aren’t). I’m assuming you know how to draw Lewis structures and understand the concepts of electronegativity and formal charge, as well as being able to interpret line drawings, but that’s it. If you’re not at that level, back up and read up on those concepts. OK. Let’s start with the first question: how do we tell where the electrons are in a molecule? The first skill is being able to draw proper Lewis structures for a molecule. To succeed in organic chemistry you absolutely need to be able to do this in your sleep. The Lewis structure should account for all the electrons around an atom, including the often-hidden lone pairs of electrons if applicable. Let’s have a look. The second skill lies in being able to apply electronegativity to determine partial charges in bonds. See, our drawings of chemical structures can sometimes get in the way of what is really going on with the electrons. If we just paid attention to the drawings themselves, the lines we draw between atoms – “covalent bonds” – are electron pairs that are shared equally between the two. However, the difference between the idealized sharing of electrons in a covalent bond versus the reality of different electron densities is, to use an analogy, not unlike the difference between a utopian socialist worker-state, and Soviet Russia. Remember electronegativity – a ranking of an atom’s “greed” for electrons, in other words? In a bond, the more electronegative element will have a greater share of the electrons, and a partial negative charge to reflect this greater electron density. The less electronegative element will have a partial positive charge to reflect the lack of electron density. Let’s look at a few simple molecules and analyze the dipoles in their bonds by comparing relative electronegativities. Remember the mnemonic for electronegativity? “Phone call bro…. CSI is on, please hold…. bye” . Why is it important to go through all of this? Because in chemical reactions, electrons will flow from areas of high electron density to areas of low electron density. 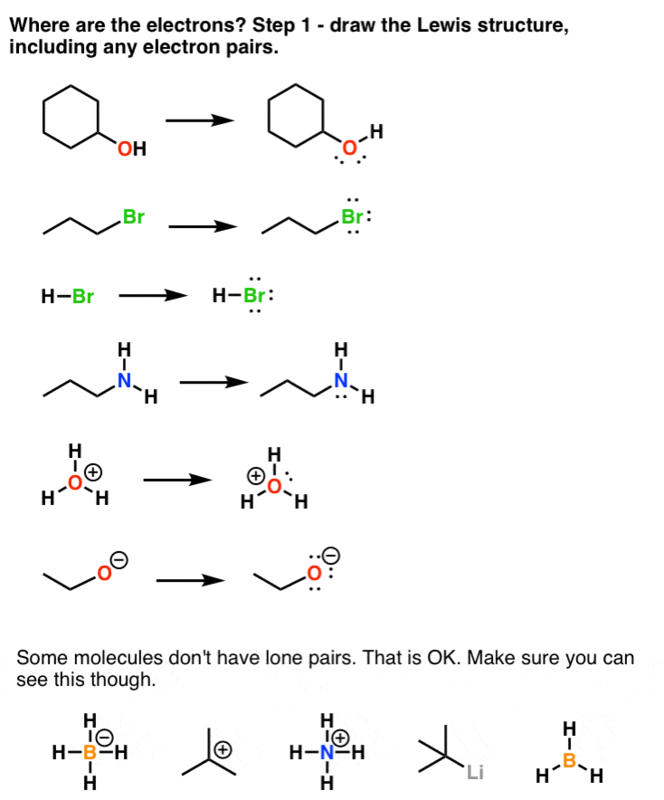 Knowing where the partial charges are is an important first step in determining where the molecule will react. Covalent bonds with large dipoles (i.e. large differences in electronegativity) are worth looking paying attention to: frequently, this will be where the “action” is. “Hold on”, you might say. “I thought electron densities were reflected by their charges, like in H3O+, BF4-, and NH2- !” No no no no no. This is one of the first real curveballs that gets thrown at you in organic chemistry, and one that continually gives students fits. 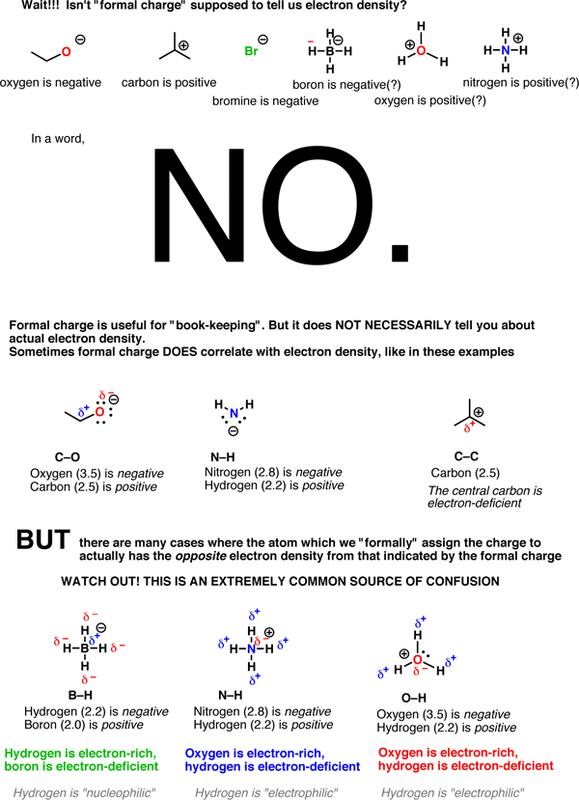 Formal charge is NOT the same as electron density. “Formal charge” gives us a bit of a dilemma. When a molecule bears a charge (either positive or negative), for bookkeeping purposes, we have to denote one atom as “bearing” that charge. However it’s important to realize that this “bookkeeping” is NOT the same as electron density, which is the real sources of reactivity. Sure, there are lots of examples of molecules where the charge actually *does* represent the electron density. 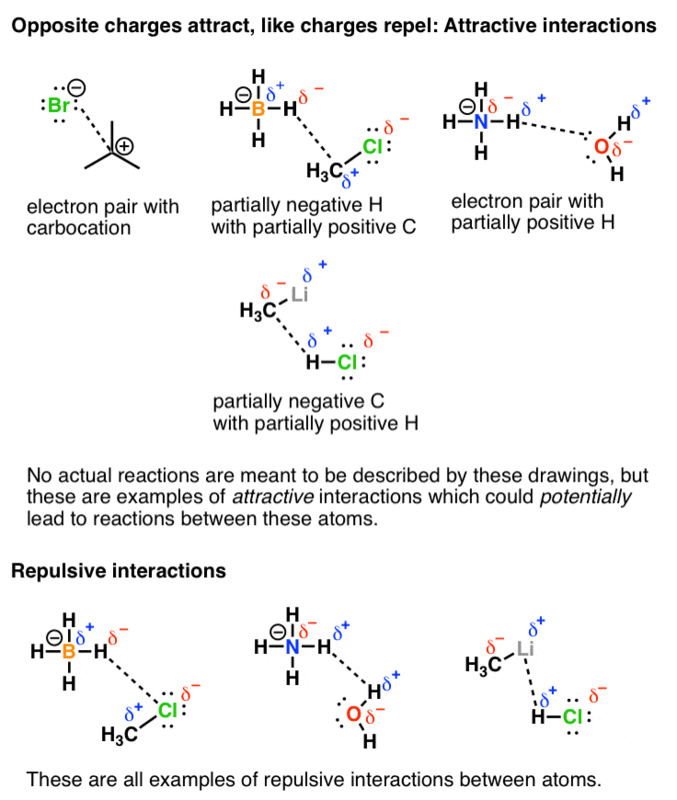 But then again, there are a lot of counter examples too – like BH4(-), NH4(+), H3O(+) and others. Make sure you understand this because it might be hard to get your head around the first time. The O in H3O+ might have a “formal” charge of +1, but it is actually the most electron-rich (i.e. negatively charged) atom on the molecule! So although the molecule H3O(+) has a charge of +1, that positive charge is actually not on the oxygen itself, but is “spread out” – dispersed – around the molecule, but particularly around the hydrogens. ( Click here to see a potential energy map of H3O(+) ). However, for “book-keeping” we assign a charge of +1 on the oxygen, because of the underlying assumption in bond diagrams that electrons are shared equally between atoms. Bottom line: if H3O(+) is reacting with an electron rich species, those electrons will go to the hydrogens (since they are electron poor), NOT the oxygen!! If you use formal charge to determine electron densities you will get screwed over on a regular basis. I apologize for writing such a long post but let’s finish by applying this concept toward some potential attractive and repulsive interactions between molecules. These are not meant to depict actual reactions, although as we will later see, reactions will begin with an attractive interaction between two molecules. Conversely, where we line up two like charges (positive-positive and negative-negative) these are sites where repulsion will occur (and reactions between these atoms will not occur). Bottom line #2: If you learn electronegativities and how to assign partial charges, you will be always be able to figure out where the electron rich and electron poor areas of a molecule are, and we can apply this toward reactions. Things will get a bit more complicated when resonance is possible. More on that in the next post. Note how on the last part of the 3rd slide I threw in some new words – “electrophilic” and “nucleophilic” to denote “electron-poor” and “electron-rich” respectively. Much more on these later. Here’s an excellent online resource on the topic of electrostatic potential in organic chemistry from Reed College. Another great article! I’m looking forward to the rest of the series. Great article! You always help me figure out a lot of stuff!!! Is there any way to figure out what the HOMO and LUMO of molecules are with regards to the electron densities? Not sure exactly how to answer that. If you can identify the HOMO and LUMO of a molecule, you’ve identified the most reactive components. The HOMO will be where the electrons are donated FROM (the nucleophile) , and the LUMO is where electrons will be accepted TO (the electrophile). It’s difficult to generalize at this stage because there are 3 types of nucleophiles – lone pairs, pi bonds, and sigma bonds, and also 3 major types of electrophiles: p orbitals, PI* (antibonding) orbitals, and sigma* (antibonding orbitals). For this post at least I can tell you that if we are just talking about the HOMO of lone pairs, the highest-energy (most reactive) lone pairs will be on the atoms of lowest electronegativity. That’s why H3C- is more reactive than H2N- which is more reactive than HO-, etc. Not accounting for solvent effects. And if we are talking about the LUMO of sigma* orbitals (I haven’t talked about pi orbitals yet), the largest “lobe” of the sigma* will be found on the more electropositive atom of a given dipole. This is admittedly a pretty hand-wavey treatment. In order to know what the HOMO and LUMO are (and their energies) with more certainty you can calculate the energies using a package like Gaussian (beyond the scope of our discussion) or infer from experimental results. thanks for the helpful post! one question – in the last diagram you depict a repulsive interaction between the (+) Li and the (+) H, but could there also be an attractive interaction between the (+) Li and the (-) Cl? Which would be more relevant in a reactive situation? There could, yes, but the carbon-hydrogen interaction is much more significant. We get to this later when we talk about nucleophilicity and electrophilicity. great James for clearly discussing the difference between the electron density with formal charges. You have explained it very clearily with suitable examples where otherwebsites books have not done it. Thank you so much for going into “nit-picky detail depth” and repeating the concept on this post, I don’t know if this is true but i believe that students who’ve been confused with detail and struggle seeing the fine line between two similar things in chemistry, find better/enjoyable when teacher treats us as if we are “no nothings”-at least i do- that can just be filled with clear info. ( I hope that made sense). I’m writing this with much thanks sir. This topic is indeed confusing. I don’t have any problem of electron flow and the circuit analogy. What always seems to get me though is where the wires are and where they aren’t – to stick with the analogy. I think I’m getting a grasp on it though. As I just re-read this post, I noted you mentioned bond overlap and resonance. So, is the basic rule that the “wires” through electrons can migrates are limited strictly by orbital overlap? Thus, is it true that the default case is that migration is limited to the bond itself unless either of the two associated orbitals are also overlapping elsewhere? Is there a basic set of rules to use when determining the extent to which partial charges propogate? What I’m looking for is a mental model of that circuit that goes with a particular molecule, which would be similar to the structural diagram but with lines that indicate how they are “wired up”. Interesting, useful. But, to say thet the oxygen in hydronium is partiall negative is incorrect. It is less partially positive than H, but it is not negative. The important reason why nucleophiles do not attack oxygen is that this leads to thermodynamically disfavored intermediates for reasons of formal charge/octet rule. Nucleophiles *can* attack oxygen, if it’s attached to a decent leaving group. For instance, look at the migration step in hydroboration-oxidation. The key is that oxygen must have a low-lying sigma* orbital that can be attacked by a nucleophile. That’s not present here in H3O+ because a nucleophile would have to liberate H– , although that specific point is a bit beyond the topic at hand.